Quick Study: Sergei Lukyanenko is one of Russia’s bestselling, best-loved, and best-honored science fiction writers. The Lukyanenko File: Sergei Lukyanenko, a trained psychiatrist, has won numerous prizes for his science fiction and fantasy novels, many of which have also been bestsellers. Film adaptations have been wildly successful: the film version of Day Watch, the second installment of Lukyanenko’s Watch pentalogy, broke Russian box office records. 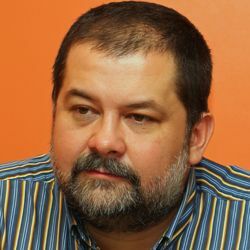 Lukyanenko was first published as a fiction writer in the late 1980s, making a breakthrough in 1998 with his first Watch book, Night Watch, an urban fantasy novel. Lukyanenko in 1999 became the youngest winner of the Aelita award for contributions to the development of the fantasy genre. Some of his books have been adapted into board and computer games. Psssst………: Lukyanenko initially went into medicine because he’s from a family of doctors; his wife is a psychologist. He has been known to keep pet mice and has a collection of hundreds of mice made of materials ranging from crystal to chocolate. Lukyanenko’s Places: Born in Karatau, Kazakhstan, lives and works in Moscow. Lukyanenko on Lukyanenko: Lukyanenko’s Web site says he defines his genre as action-packed fantasy or fantasy of the journey. Lukyanenko also acknowledges his early imitation of the styles of Vladislav Krapivin and Robert Heinlein. Lukyanenko Recommends: The Strugatsky Brothers. When questioned by the newspaper Izvestiia about favorite children’s books, Lukyanenko mentioned enjoying the works of Astrid Lindgren, the Brothers Grimm, and Hans Christian Anderson as well as Nikolai Nosov’s Neznaika and Monteiro Lobato’s The Yellow Woodpecker Farm. He also says he loved fantasy books as a child, mentioning Ivan Yefremov’s Andromeda: A Space-Age Tale. A slew of fantasy writing awards and nominations for individual works and general achievement, including Aelita, Bronze Snail, and the 2005 Ruscon science fiction writer of the year. “The Heart of the Snark” is in the anthology Life Stories: Original Works by Russian Writers (Russian Life, 2009, story tr. Liv Bliss) and “Destiny, Inc.” is in The SFWA European Hall of Fame: Sixteen Contemporary Masterpieces of Science Fiction from the Continent (Tor Books, 2008, story tr. Michael M. Naydan and Slava I. Yastremski).